On Second Scoop: Ice Cream Reviews: Back from NYC! Wow, it's been a long 12 hours, over 7 of which were spent driving to and from NYC! 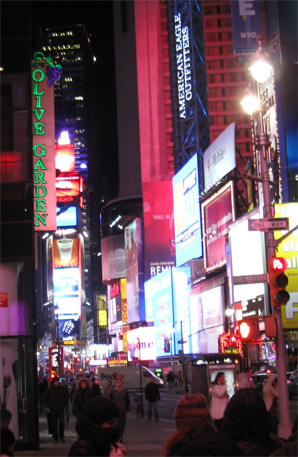 See I can prove it with the worst picture of Times Square ever! from Ben & Jerry's! 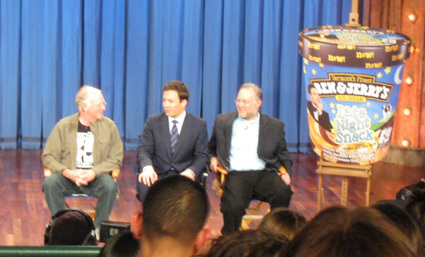 Today marks the two year anniversary of Jimmy Fallon taking over late night and so they used this special day to announce his very own flavor of Ben & Jerry's! Now it's late and I've got to get my (self) back to work tomorrow, but if you are still up, make sure you watch Jimmy tonight for the big announcement! Updates: If you want to see the announcement, you can watch the show here and just forward to the 10min mark. There is also the official Frazier Moore Associate Press article floating around on everyone's website, I would read the NPR version since it has the best photos. The print article doesn't mention it, but Ben did on TV: Check out Fair Trade (USA) and learn about the fairness of farmers and workers get a fair (living) wage for all the hard work they do! Update 2: Reviews and commentaries are popping up all over the web, well, mostly commentaries. Funny how you serve a bunch of ice cream to the press and they forget to mention that part in their articles! i'm all for new b&j flavors, but giving one to jimmy fallon seems a bit iffy to me. from what i read from your link, it's because he sang a song about them a while back. does anyone really think that jimmy deserves a flavor over, say, letterman or leno? and for the record, i think craig ferguson's funnier.